Orlando | Hurricane Maria brought destruction and devastation to much of Puerto Rico, but for one seminarian in the Diocese of Orlando the storm blew in wonderful blessings. Angel Garcia, 23, moved to Orlando from the island five years ago with two goals – one, to be closer to his father and two, as he jokingly puts it “to run away from his call to the priesthood.” His mother, sister and brother remained in Puerto Rico, supporting Garcia from afar. It wasn’t long before he heard the Lord whispering again. “God has a big sense of humor and He followed me to Orlando,” he shared. “I would ask for signs and He would answer me.” So Garcia contacted the Vocations Office and entered the seminary. Flash back to last September. Garcia’s mother, Ivette, learned she had pre-cancerous cells in her body that needed to be removed immediately. Her surgery was planned for the same day Hurricane Maria slammed Puerto Rico. The life-saving procedure was cancelled because the storm wiped out nearly all electricity across the island. Garcia knew he had to do something. He saved every penny he had, called his family and convinced them to move to Orlando. The next mission was to find insurance and a doctor for Ivette. Despite challenges and several appointment cancellations, Garcia’s mother did eventually have surgery and not a moment too soon. “After they removed everything, they sent it to a lab and confirmed the cells had turned cancerous already,” he noted. “It was blessing because everything was a success. Her recovery went very well.” Today Ivette is cancer-free and laser-focused on her daughter, Melany. Melany is a bubbly, brave 10-year old who lost her hearing at age 2 due to the side-effects of antibiotics given to her as a premature baby. Doctors in Puerto Rico fitted her with hearing aids. Each year Melany’s hearing deteriorated, but she never lost hope. She would even put her hand on family members’ throats to feel vibrations when they spoke and then mimic those movements herself for better pronunciation. Once the family was settled in Orlando, they decided to consult specialists to see if anything could be done to restore Melany’s hearing. The initial diagnosis was not good. Doctors confirmed her situation would continue to worsen and regular hearing aids would not help much longer. They suggested the family consider cochlear implants, electronic medical devices that do the work of damaged parts of the inner ear to provide sound signals to the brain. Melany’s mother prayed about the very delicate, 3-hour procedure and eventually decided it was the best option. 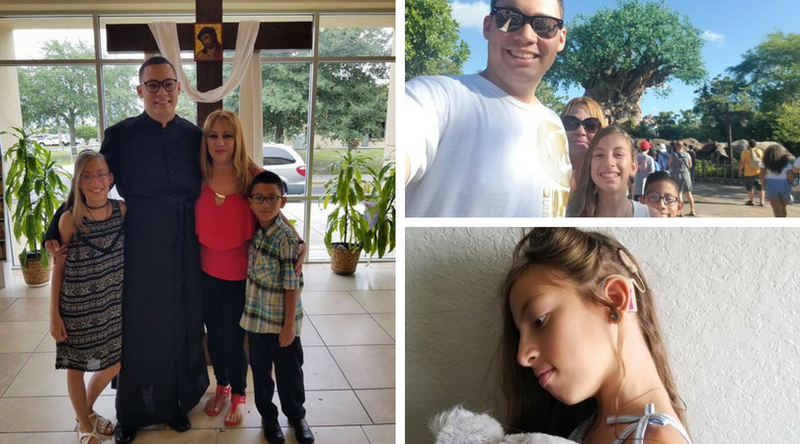 Melany still cannot hear perfectly and will need surgery on her right ear over Christmas or Spring break, but her life continues to blossom here in Orlando. In Puerto Rico, she was the only hearing-impaired student in her class. Now she is enrolled in a school that caters to hearing-impaired children. On the first day, she bounced back home excitedly saying “Mommy, mommy there were kids like me there!” said Garcia.